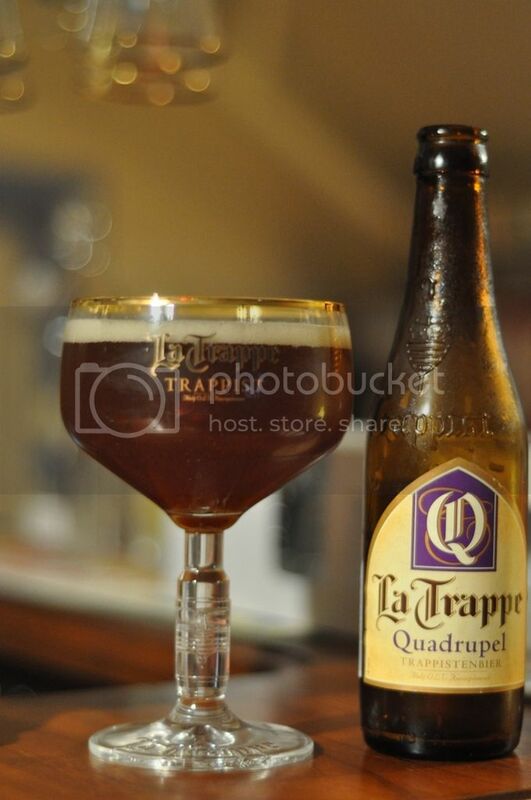 La Trappe (Koningshoeven to our American friends) is the only Trappist beer produced outside of Belgium. Given my love of Trappist beers, I thought I may as well use this as my beer for the Netherlands, if for nothing else than to drink something good after yesterday's disaster. A quad is a style almost exclusively made in Belgium and the Netherlands. The beer is typically high in alcohol (9-13%) and often dark in colour (see above). These beers are characterized by extremely bold flavours, big bodies and rich malts. This is one of my favourite beer styles, because of the complex flavours. I am strongly looking forward to the quadrupel after having the dubbel and tripel, which typically have weaker flavours than the quad. Should be a fantastic beer. Like all Trappist beers this pours magnificently. A lovely dark amber liquid spills forth from the bottle followed by a crisp well-sized off white head. This head does subside slowly but leaves a creamy substance on top of the beer, for the entirety of drinking the beer. Despite the high alcohol content remember this is still a bottle-conditioned ale, so has very little carbonation. I think it looks spectacular for the style, and really can you go past a Trappist beer in it's glass? I don't think so! The aroma is incredibly full-on without being over the top. There is a strong smell of sweet dark fruits; I believe these to be raisins and plums, but am more than open to suggestions what these might be. Earthy spices are also present, as are strong sweet caramel malts. This beer has an overall feel of a dark fruit cake doused in caramel, similar to what one would have at Christmas. I often say that I do not like to smell the alcohol in my beer but it's presence in this beer seems so balanced that it doesn't bother me. If this tastes anything like what it smells, this will be an incredibly rich, spectacular beer. This beer is simply exactly what I was looking for tonight. It's a brilliant beer. The flavours are incredibly complex and have multiple layers. The malts are quite sweet and dark with hints of chocolate and cinnamon, however these are quite light. A layer of breadiness and earthy spices hit next, cloves being the main culprit, however unlike some wheat beers the cloves are not overdone. The beer gains a slight bitterness as what I believe are green apples, the raisins and plums come into the roof of the mouth, these fruit may have been marinated in rum or cognac as I get a strong alcohol taste at this time. The aftertaste is of cloves and is overall a sweetish warming beer. I simply can't fault this beer, there isn't alot you say about this beer that isn't positive. This certainly isn't the finest Belgian beer I've ever had, but as quad's go this is right up there. The beer has a medium body with very low carbonation and despite the high alcohol content is very drinkable. I would suggest this as an aperitif or by itself with some fine cheese. The stronger the flavour of the cheese the better the beer should taste. I cannot recommend this beer highly enough and at ~$6 a bottle this is a great buy!